Description: The 24h cream moisturizes and tones the facial skin while preventing the formation of the skin. Its composition with natural snail extract and organic rose gives amazing results in hydration and shine. 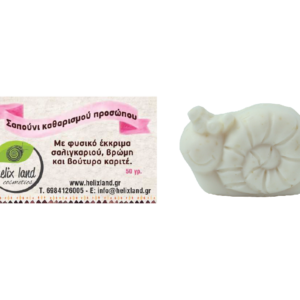 Specifically, the action of the natural snail extract towards the moisturization and the reconstruction of the skin is best combined with the action of organic rose ingredients, which revitalize and tone the skin, reconstruct its cells and improve its texture. Moreover, it maintains the PH of the skin, enhance its elasticity, provides antiseptic and anti-inflammatory properties. The rose is a natural source of vitamin C which proivdes powerful antioxidant protection and shine. The composition of the cream contains all the nutrients that the skin needs to look young and fresh and bring out the natural beauty. The cream has a soft rose aroma that offers a stimulating feeling of beauty and harmonization. The 24h cream was developed to provide shine, moisturization and tightening, properties that you yourself can ascertain! The main component of our cosmetics, the natural snail extract, we collect it naturally from snails in our unit and offer it unchanged in our cosmetics.